Party Down Season 1 DVD Giveaway! Readers, I have a treat for you today! I'm going to be having my first ever super special prize giveaway! Yep, I am clearly going places. This is for the TV lovers out there, wherever you may be! 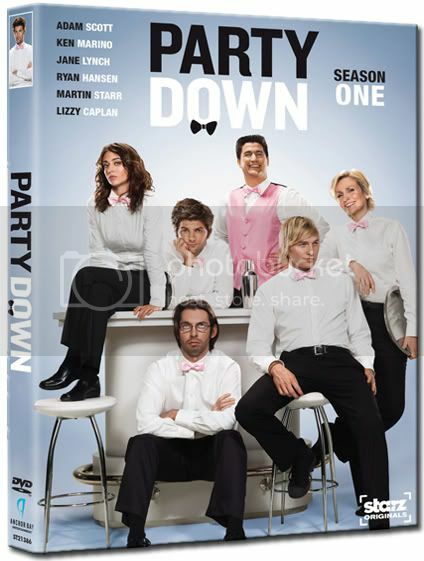 The Season One DVD Set for the dearly and sadly departed Starz original series - Party Down! For those of you who haven't seen this series, it's hilarious, and I highly recommend you watch it, even though there are only two seasons for you to enjoy. Leave a comment on this post by Oct. 8 at 11:59 p.m. PST answering the question: What is your favorite television show currently on the air? Please only enter once, it's only fair. From there, I will pick a winner at random! I'll announce it here on the blog, then it's up to whoever is the lucky winner to claim their loot. Contest closed. The winner is Lilly, whose answer was: "Tough question. There are so many good shows out there right now. I'd have to say Community though. It's the only show I watch at least twice in order to catch all the things I may have missed because I was laughing so hard the first time." Project Runway. Love the drama this season :) The best since they moved to Lifetime. Glee! Although, to be honest, if they pull any more of these lazy we'll-just-copy-the-music-video episodes, I'll might be forced to change my answer. Tough question. There are so many good shows out there right now. I'd have to say Community though. It's the only show I watch at least twice in order to catch all the things I may have missed because I was laughing so hard the first time. Rubicon. Too bad nobody else cares. Psych, ever since the beginning. There are a few I enjoy but I think my favorite is Criminal Minds.